Crystals are formed through a process called crystallisation. The atoms in these structures are packed very closely together, as this is the most efficient arrangement and helps to make the gaps between each atom as small as possible. These crystals are easily identified through their shiny surfaces. This is because the delocalised electrons are not tied to any one specific bond, and so can move freely throughout the crystal lattice, absorbing and emitting light of any wavelength. Ionic crystals are crystal structures in which the atoms are held together through ionic bonds. There are no free electrons in this structure, and rather the atoms are bound through electrostatic force arising from a difference in charge. 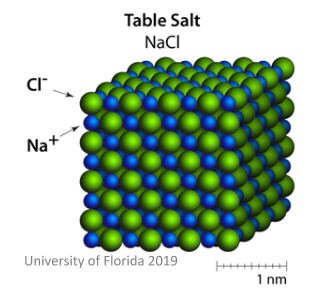 The image below shows a good example of an ionic crystal: common table salt (also known as NaCl). 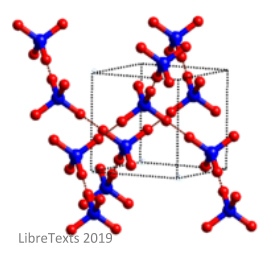 Here you can easily see the ions with opposite charges in the lattice structure. Lattice energy is the amount of energy released when one mole of an ionic crystal is formed from one mole of positive gaseous ions and one mole of negative gaseous ions (when these are separated by an infinite distance). Covalent crystals are structures in which the atoms are bonded through covalent bonds – this is the type on bond where the atoms share their outer electrons. You need to know that these covalent bonds are directional, which essentially forms one huge interlocking crystal structure. The image below shows the structure of diamond, a covalent crystal. The red lines in the image represent these very strong covalent bonds. 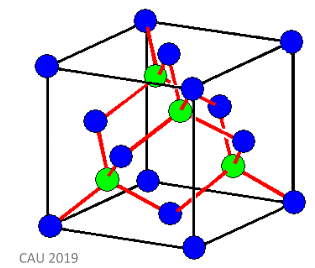 The blue atoms are representative of carbon atoms which sit on ‘lattice points’, and the green atoms show atoms which are not lattice points. Molecular crystals are structures in which the atoms are bonded through weak intermolecular forces. If the structure is formed of nonpolar crystals, then the forces will be dispersion forces. If the structure is formed of polar crystals, then the forces with be dipole-dipole. In structures, such as ice (shown in the image below), the forces will be hydrogen bonds. The intermolecular forces holding these molecular crystals together are a lot weaker than covalent bonds or ionic bonds.